Abstract. Headwater streams represent a substantial proportion of river systems and many of them have intermittent flows due to their upstream position in the network. These intermittent rivers and ephemeral streams have recently seen a marked increase in interest, especially to assess the impact of drying on aquatic ecosystems. The objective of this paper is to quantify how discrete (in space and time) field observations of flow intermittence help to extrapolate over time the daily probability of drying (defined at the regional scale). 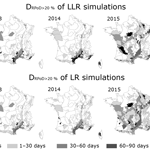 Two empirical models based on linear or logistic regressions have been developed to predict the daily probability of intermittence at the regional scale across France. Explanatory variables were derived from available daily discharge and groundwater-level data of a dense gauging/piezometer network, and models were calibrated using discrete series of field observations of flow intermittence. The robustness of the models was tested using an independent, dense regional dataset of intermittence observations and observations of the year 2017 excluded from the calibration. 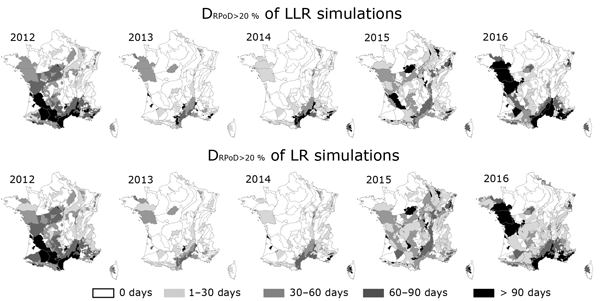 The resulting models were used to extrapolate the daily regional probability of drying in France: (i) over the period 2011–2017 to identify the regions most affected by flow intermittence; (ii) over the period 1989–2017, using a reduced input dataset, to analyse temporal variability of flow intermittence at the national level. The two empirical regression models performed equally well between 2011 and 2017. The accuracy of predictions depended on the number of continuous gauging/piezometer stations and intermittence observations available to calibrate the regressions. Regions with the highest performance were located in sedimentary plains, where the monitoring network was dense and where the regional probability of drying was the highest. Conversely, the worst performances were obtained in mountainous regions. Finally, temporal projections (1989–2016) suggested the highest probabilities of intermittence (>35%) in 1989–1991, 2003 and 2005. A high density of intermittence observations improved the information provided by gauging stations and piezometers to extrapolate the temporal variability of intermittent rivers and ephemeral streams. How to cite: Beaufort, A., Lamouroux, N., Pella, H., Datry, T., and Sauquet, E.: Extrapolating regional probability of drying of headwater streams using discrete observations and gauging networks, Hydrol. Earth Syst. Sci., 22, 3033-3051, https://doi.org/10.5194/hess-22-3033-2018, 2018. Streams which may stop flowing are poorly gauged. To improve their characterisation, we use an extended network providing monthly visual observations stating whether streams are flowing or not across France. These observations are combined with discharge and groundwater level in models to predict daily regional probability of drying. This approach allows identification of the most impacted regions by flow intermittence and estimation of the probability of drying dynamics over the last 27 years.